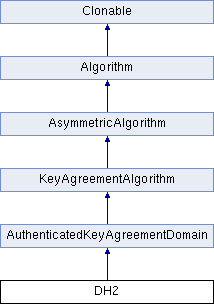 A Diffie-Hellman domain is a set of parameters that must be shared by two parties in a key agreement protocol, along with the algorithms for generating key pairs and deriving agreed values. Definition at line 20 of file dh2.h. Definition at line 32 of file dh2.h. Provides the size of the agreed value. Definition at line 34 of file dh2.h. Provides the size of the static private key. Definition at line 37 of file dh2.h. Provides the size of the static public key. Definition at line 39 of file dh2.h. Generate static private key in this domain. Definition at line 41 of file dh2.h. Generate a static public key from a private key in this domain. Definition at line 43 of file dh2.h. Generate a static private/public key pair. GenerateStaticKeyPair() is equivalent to calling GenerateStaticPrivateKey() and then GenerateStaticPublicKey(). Definition at line 45 of file dh2.h. Definition at line 48 of file dh2.h. Definition at line 50 of file dh2.h. Definition at line 52 of file dh2.h. Definition at line 54 of file dh2.h. Definition at line 56 of file dh2.h. Agree() derives an agreed value from your private keys and couterparty's public keys. The other party's ephemeral public key is validated by default. If you have previously validated the static public key, use validateStaticOtherPublicKey=false to save time. Definition at line 60 of file dh2.cpp.